The USA finished with double the number of total medals earned by any other country. 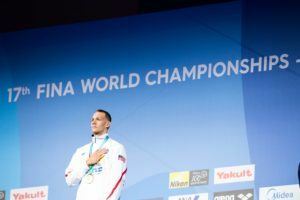 They tallied up 32 medals, while Japan and Hungary tied for 2nd with 16 medals each. 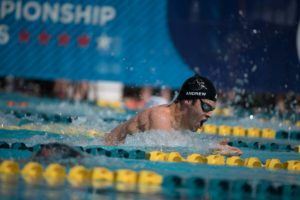 Contributing to the American medal total on day 5 were Michael Andrew (50 fly gold), Grace Ariola (50 back bronze), and the women’s 4×100 free relay (silver). 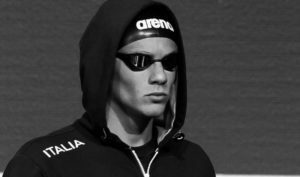 Italy’s Nicolo Martinenghi is the headliner in tonight’s 50 breast semifinals as he chases his own Junior World Record. Swimming does more than 4 times as well as the average NFL game in one key area. The American team saw incredible improvement at the 2017 World Championships compared to their disastrous 2015. While there were more nations entering only men or only women in pool swimming at the 2017 World Championships, there were actually 15 fewer women’s teams and 10 fewer men’s teams compared to the 2015 World Champs. With so many great swims over the course of the meet, we’ve narrowed it down to the top 15 performers overall. 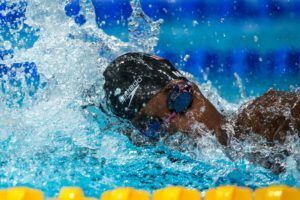 See the Simone Manuel 2017 FINA World Championships Photo Vault. 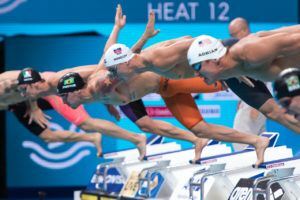 The 2017 World Championships featured eight days of exciting races, and there was no shortage of records. Compared to the 2015 Championships, the number of records broken was relatively even. Kazan had 12 worlds records, Budapest had 11. 21 Championship records in 2017 surpassed the 19 there was in 2015. However, there was a big difference in the number of American and ‘Americas’ records (combining North & South America) broken. After just five in Kazan (Americas), including three from Katie Ledecky, they broke 20 in Budapest. There was also a total of 13 individual American records broken, a massive haul. In terms of those who broke the records, there was a select few who were doing most of the damage. 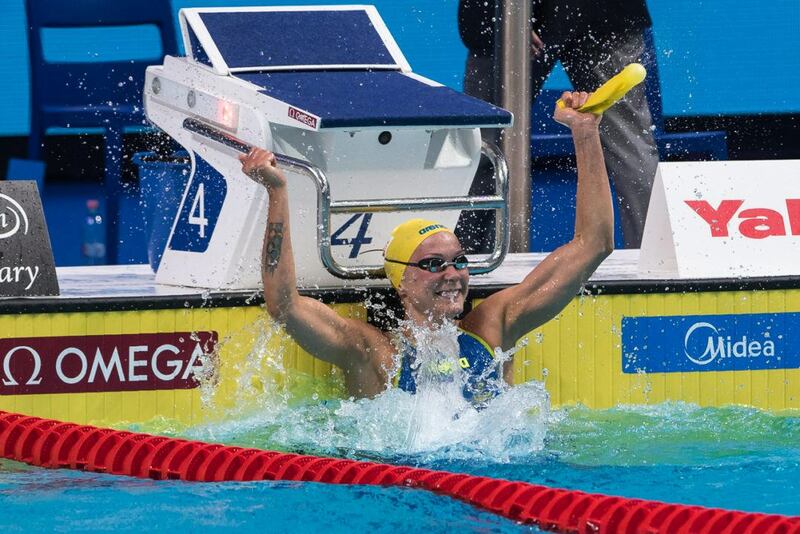 Seven individual world records went down from just four swimmers. 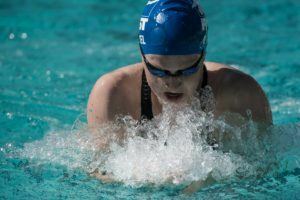 Adam Peaty, Sarah Sjostrom and Lilly King each set two, while Kylie Masse broke one of the vaunted super-suited marks in the women’s 100 back. Both of Peaty’s records came in the 50 breast (prelims and semis), so in total only one men’s event left with a new world record compared to six for women (five individual). 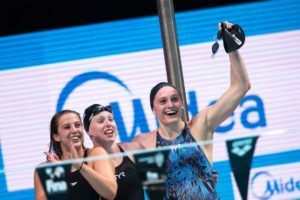 The American women broke the medley relay record, and three more came from the U.S. in the mixed events which have only been on the scene for a few years. Those five led the charge in Championship records as well, with Ledecky, Chase Kalisz, Anton Chupkov and Katinka Hosszu putting their names on the board as well. Russian Kliment Kolesnikov and Hungarian Kristof Milak did a ton of damage combining for a total of five junior world records, and continentally Farida Osman‘s name sticks out after she had five African record breaking swims (albeit over two events). And of course we can’t look past the incredible week of Caeleb Dressel, who set four individual American records and was on a pair of the world record breaking mixed relays. Below, take a look at the full list of world, championship, junior world, and continental records broken (plus American records). « Which NCAA Team Fallen On Recent Hard Times Will Be First Back to Top Ten? Despite it not being ratified by FINA, we’re just gonna recognize the 2:08 as the record. Sarah Sjostrom set a WR in the 100 fly in 2009 (the notorious year of supersuit records). She then went on to swim faster and set a WR in the textile suit. Was there anyone else that did that? 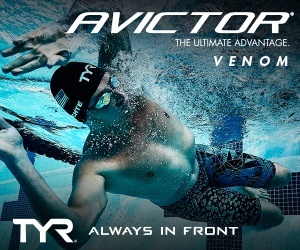 Lochte 200 IM comes to mind. Yeah, Lochte did break his own 2009 record. He broke it by .10 seconds in 2011, maybe the best year of his career. A lot of those 2009 records that still stand were one-off performances. 2011 Lochte in Shanghai was one of the greatest individual performances of all-time. Of course behind Phelps in 2007 & 2008 though. His 200 back and 200 free especially were gnarly. I watched the 2 free the other day. I still think that 4 free relay in London messed his whole game up. He was ready for the double gold in 200 back and IM and that silver in the 200 free behind Agnel. Shanghai had the perfect schedule for him. No doubles, and his races were perfectly spread out over the 8 days. 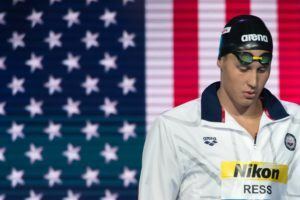 In London, he had 200IM/Back prelims, semis and final back to back. He’d have won 200 IM had he skipped 200 back. @James Sutherland: you called KYLIE MASSE a “culprit” for breaking the world record in the women’s 100 back. My dictionary defines “culprit” as a person who is responsible for a crime or other misdeed. Synonyms include: guilty party, offender, wrongdoer, perpetrator, miscreant. I don’t think any of these words applies to Kylie or her noble accomplishment of breaking an 8-year-old (suited) world record. Are you, perhaps, confusing “culprit” with another word? Yeah. The joke is because there’s no actual crime in Canada. Except for thee occasional guy trying to ride a moose.